We all need a break: Coloring can be an outlet to rest and unwind from life’s stressors. Quality time with your kids: Instead of throwing paper and pencils at your kids to distract them while you clean the kitchen or do laundry, join your kids! They’ll appreciate spending time with you and you will, too. Stimulate your creativity: Between dirty diapers, cleaning dishes, and preparing food, it’s easy to lose touch with your creative side. Coloring can help you get your creative juices flowing again. 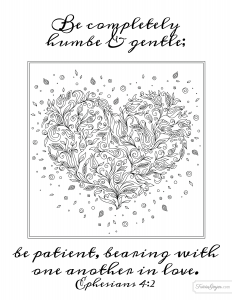 With Valentine’s Day just around the corner, I wanted to share with you FREE coloring pages with verses about God’s love. Click the image, download it to your computer, print and enjoy. Get your colored pencils out and spend time praising God for His merciful and unending love! Click here to download the set! I love these! I have a folder labeled Mommy’s Coloring pages in my word area. I printed them all! Thank you, Tricia!!! So happy you can enjoy them! Is it okay to share these?